You know that you can’t step in the same river twice, right? Well how can you write a novel set “now” when “now” is rushing ahead of your typing fingers? Has technology been good for the novel? So far, I think so. Starting with the printing press and moving to desktop computers and eBooks, the mechanics of writing for publication are easier than ever, I think. (In my case, I’m relieved to have no more clothes ruined by White Out, after the typewriter drum slams into that corrective fluid.) True, some writers complain there are too many writers and not enough readers. Well, I think that is a symptom of larger changes. Let’s talk about smaller changes–the words we need to use. Technology and the now-cliche rapid pace of change poses word choice problems for the literary “now”. Because machines are increasingly integrated in our lives, and the machines themselves evolve rapidly, the names for the machines also changes rapidly. So any pretense of writing about “now” needs to be extra cagey about referring to these types of objects and their associated venues. In my case, i wrote a bicycle adventure novella in 2000 for publication in a small bike magazine. I rewrote it over the last year for publication as a novel this week, 2015. Fifteen years and so much has changed… Now if I started writing the novella in 1810 and rewrote it as a novel in 1825, a letter would still be a letter, a candle would still be a candle. If I didn’t mention the experimental railroads in England, I don’t think it would ruin the feeling of “now”. I would merely need to be careful about my references to Napoleon. In a novel set “now”, meaning “around the year 2000” when I started, and meaning “around the year 2015+” when I finished, it seems reasonable that a character would want to use technology to talk to another character remotely, both spoken and typed electronically. So what words should a writer choose to express this? Between 2000 and 2015, email became less a part of popular life. It’s still important for office work. But in private life, it seems more old-timey, something older people are more likely to cling to than the young. In private life, has mostly usurped the role of email. People still talk on the phone, but are more likely to text. The subculture of texting has even established its own form of English, with abbreviations, acronyms and symbols. In 2000, many people used mobile phones in the USA and called them “cell phones” or might say “my cell”. But then the brains in these devices became as sophisticated as desktop computers (another term prone to expiration). iPhone came out in 2007, an Android phone in 2008. Use of “cell” declined, while people identified their phones by brand, or called them “mobile phones”. Apart from use, people writing about the technology used the term “smartphone”, but few people use that in average discussions, so far. And all the while, many Americans were giving up their landline. Children growing up now may be flummoxed how to use a landline. And recently video chatting has become practical with Skype, FaceTime, Google Hangouts, and so on… I use these myself with ease. While video chatting sounds science fictional, what about Twitter and all the social media platforms clamoring for our attention? These weird new forms of social display, group communication, new forms of obnoxiousness, commercialization, self-promotion, entertainment, togetherness? Fictional characters might use these, but certainly some of them will not last long. Even a strong brand might transform the way it functions and change its name. In this case, I think a writer is safe for a temporary, moveable sense of “now” to just use the term “phone” and to consider them mobile and smart. I did feel I needed to update references to email, and avoid references to brands. Since my characters are mostly active, away from home, bicycling, and sometimes in peril, it was easy to avoid social media references. But I think a novelist trying to write the about normal life of “now” would have more difficulty. It might be unnatural to avoid references to technology that are a big part of many people’s lives, yet will soon change again. Therefore it might be best to give up the “moveable now” and fix the time, or find some other compelling, creative solution. 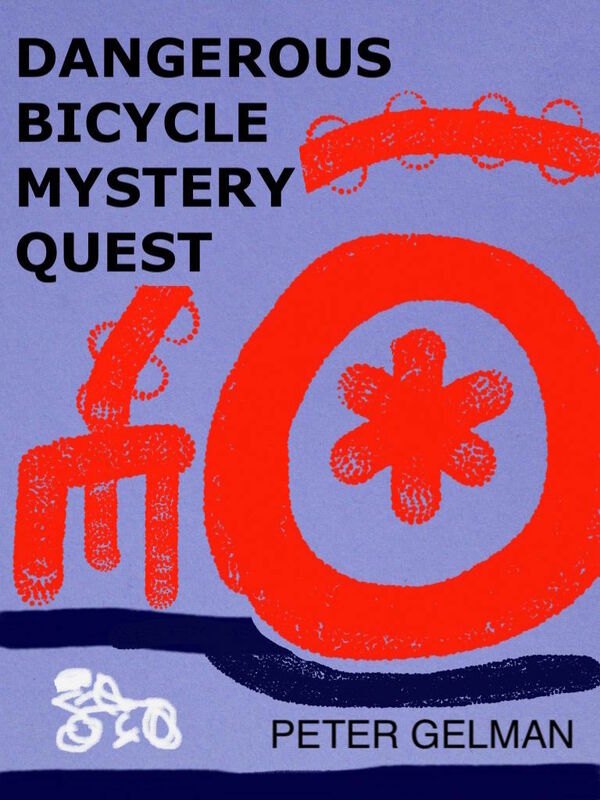 My novel, Dangerous Bicycle Mystery Quest is available now in popular eBook formats around the world (#kindle goo.gl/yrIid7 / #nook goo.gl/URm0Mq / #iBook goo.gl/ffJGTK / and more). It will be available as a paper book around September, 2015. I just finished reading THE NIGHT LAND by William Hope Hodgson (1877-1918). The novel’s astonishing vision seems unique to me—and not just unique but boldly so. Unfortunately he confounds the modern reader’s experience with his choice of pseudo-antique poetic language. Nonetheless, the work’s haunting panorama, and strange framing, seems so idiosyncratic to me, and in that way, fresh and powerful. However, it does have similarities with other works, sharing the sublime Million-Year Stare. THE NIGHT LAND describes the last humans on Earth after the sun dies living in a colossal pyramid, filled with cities. Many vivid physical and spiritual terrors besiege it, such as strange, evil heads tall as mountains, alive but frozen and staring. The physical terrors are one thing, but the spiritual threats to the humans are worse. A kind of spiritual electricity of goodness, the Earth Current, powers and protects the Great Redoubt. Further forces of good sometimes appear in the form of circles of light, or light beams, halting the advance of shuddering terrors. Hodgson frames and weaves into it a love story that, by some kind of transmigration, spans his own time with that millions of years in the future. This love story leads the narrator to find his transmuted eternal lover in a newly discovered Lesser Redoubt, which is failing. These elements add up to a work full of strata, with depth, and breadth, which give a richness and an aesthetic validity to simply jaw-dropping visions and concepts. The pseudo-antique heightened prose does feel consistent to me with the spiritual effort to the novel. As a style it contrasts with Hodgson’s more clear efforts in his other fine works. So I think it has a purpose. Unfortunately, I think the prose style is burden that confounds the artistic success. James Stoddard recently rewrote the prose to fit modern tastes (THE NIGHT LAND, A STORY RETOLD, 2011). I read both versions and thought Stoddard did a good job. In addition to taming the prose, he added a lot of dialog. This improves the “showing not telling” of the story development, and includes new details to do so. I think this should be controversial. However, I appreciate that he did it, and enjoyed his revision–and I’m glad the original is easily available to readers. Are you familiar with the literary concept of the sublime? As usual there are a lot of interpretations and examples. Mostly simply, I’d say it is the thrill we feel when we read or see a work of art that successfully combined beauty with terror (such as standing before Niagara Falls) . Samuel Taylor Coleridge specified another element, that the sublime element includes a sense of eternity. I think THE NIGHT LAND exemplifies both. In Mary Shelly’s THE LAST MAN (1828), not exactly a dead sun but a black sun signals a plague that kills all of 21st century humanity except the narrator. This makes most of the novel’s political wrangling — the newly established English republic, the Greco-Turkish war, and a false messiah in France — futile, pointless before eternity. The novel ends with solitary narrator’s terrible grief. I don’t wish to try to pin down one specific inspiration for the individual works. It may be possible; for example, the ash from a volcanic eruption may be a specific contributor to Byron’s poem “Darkness”. I wish to consider it in a broader sense… These ideas are part of the zeitgeist of the era… Do they have something to do with artists feeling the cultural shock of revolutionary scientific discoveries at the same time as a limitation to the increasing freedoms and liberties? Intimations of the limits of both religion and progress? Is the spiritual optimism in THE NIGHT LAND a kind of Edwardian “Great Redoubt” of resistance? Well, I think I can only make the suggestion as I did, softened in the form of a question. The million-year-stare in literature continued after Hodgson—certainly Olaf Stapleton (such as STAR MAKER) comes to mind. But I would like to strike a redoubt of framing these considerations before the French Revolution and after World War I (which killed Hodgson, at the age of 40). After that, well, changes happened faster and faster, and we reached the point where we discuss the possibility of the end of history. Fortunately, whether history has ended or not, the sun is bright and cheerful as I write. I will go out now and plant tomatoes. PS: Hodgsen wrote a lot of wonderful weird stories. I enjoyed his sea stories very much. (Happily, he used a clear prose style for them.) I read them all on Kindle.